Hello friends, I hope you all had a wonderful Christmas, and are enjoying your holidays! So we didn't exactly have a white Christmas, but it sure made up for it today. So much snow! It's only the beginning, and I already had a bit of trouble yesterday morning. My mom was driving me to the train station, and she swerved into a snow bank to avoid hitting a car in front of us. We were stuck. Luckily, no one was hurt, and thanks to the kindness of several passerby's that helped us clear the snow and push us out, I was able to make it to work only half an hour late. While snow definitely adds some difficulty for us commuters, it can still be very pretty! 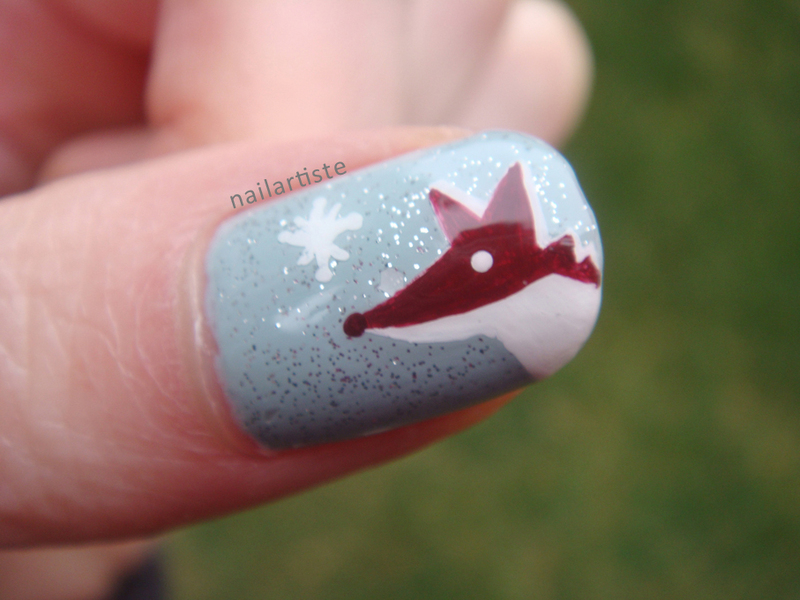 I wanted to do a snowy manicure, and I knew exactly which glitter I wanted to do it with. The base colour is Essie "Who Is The Boss", and the glitter is OPI "Pirouette My Whistle". 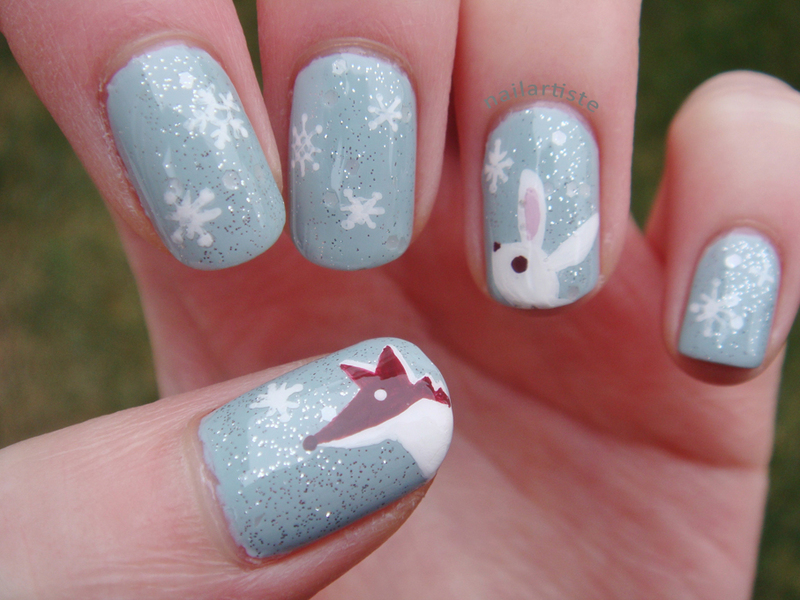 It is so delicate and pretty, and simply perfect for a soft, snowflake effect. I painted the rabbit and the fox with acrylic paint. Sorry about the dry hands. It was freaking freezing when I was taking these pictures - I ran in afterwards to slather cuticle cream and lotion on. If these guys look familiar to you, it's probably because you've seen them on that cup holding your caramel brûlée latte (mmm yum). 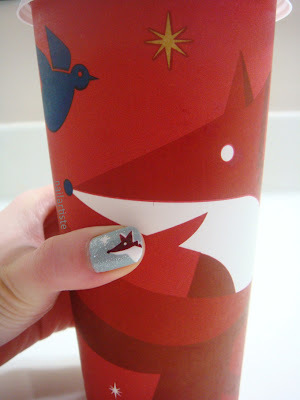 I always look forward to Starbucks' holiday drinks and cups, and I love the designs this year. 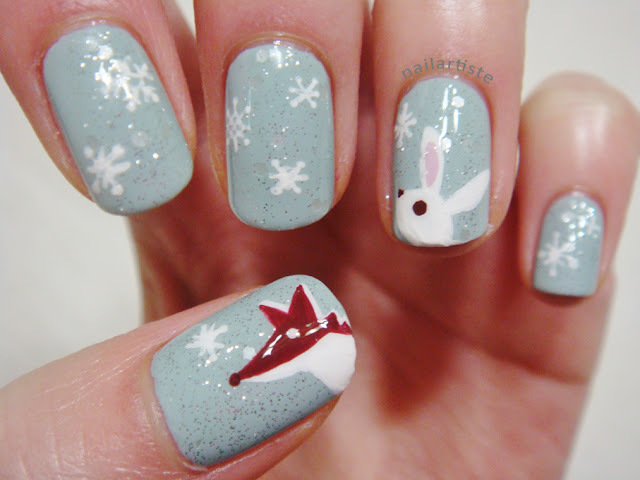 The rabbit and fox are so cute! On my right hand, I did an accent nail with the Ciaté caviar kit my cousin gave me for my birthday. The silver is "Fit for a Queen", and the pearls are in the colour "Hologram". I didn't sprinkle the pearls on my nail fully, and I love the look so much. I wore this over Christmas, but after one day, I was ready to take it off, because I couldn't stand having any more pearls falling off. Since I was going to remove it, I thought, why not experiment first and try putting some glitter and topcoat over it? 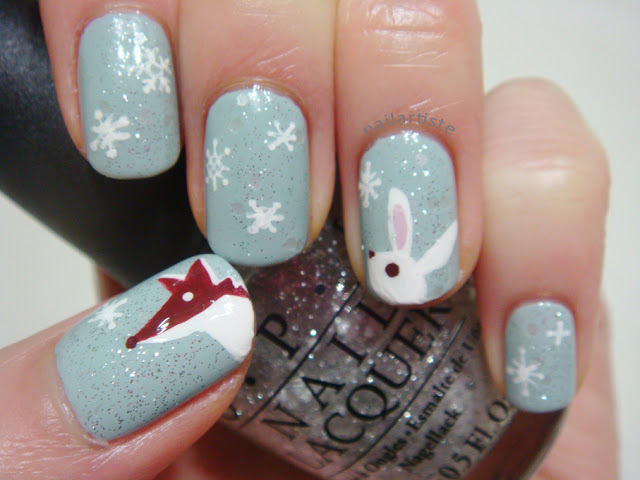 Normally, you're not supposed to apply topcoat, as it'll cause the pearls to lose their colour. So I dabbed some China Glaze "Snow Globe" over top and THIS HAPPENED. I LOVE this. The glitter over the silver and the pearls is insanely pretty. It looks like ice crystals, and as an added bonus, the pearls are now rock solid. I can go about using my hands without worrying about them falling off. I don't think I'll always get such a nice effect with other colours of pearls, though I'm willing to experiment. So this turned out to be a really long post, and I need to go to bed. I'll definitely do a full Ciaté caviar post in the future. Hope you enjoyed these! Bwah! I'm alive! Between a final exam and getting into a new routine since I started a new job, I haven't had time to do anything nail-related, and I felt so sad about leaving my blog neglected for so long. But I'm back, my friends! 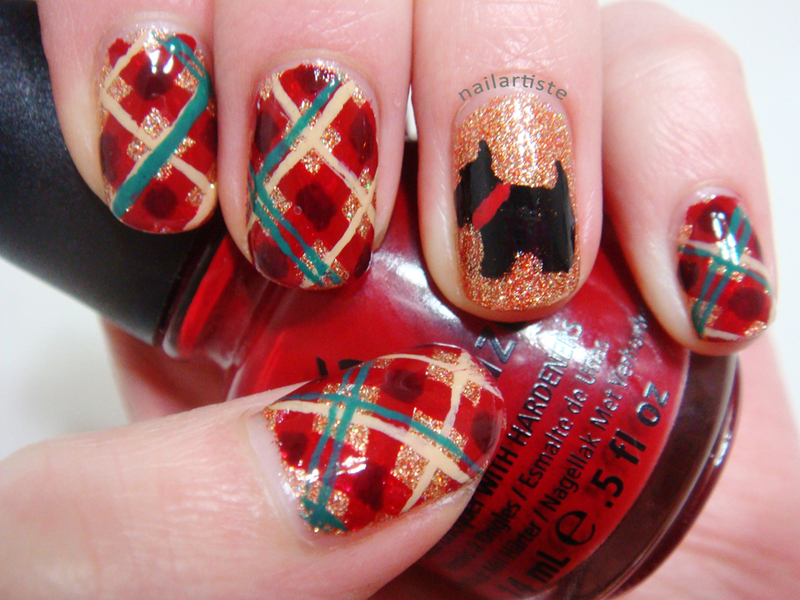 Since my last sparkly Christmas nails, I wanted MORE, and I couldn't get the idea of plaid out of my head, so I put the two together. I painted a little Scottie on my accent nail because when I think of plaid, I think of Scotties. 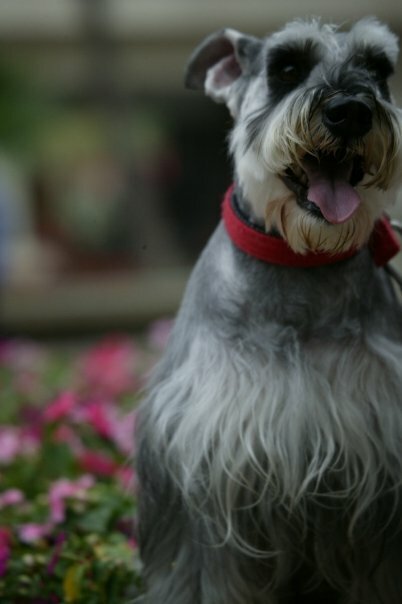 It reminds me so much of my cousins' Schnauzer, Pizza. 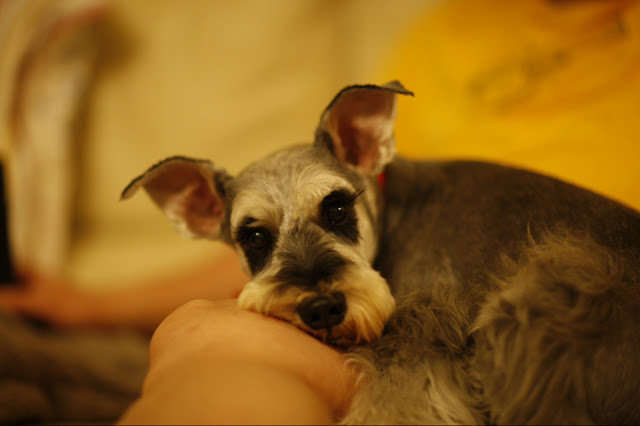 He is the sweetest dog ever, and I haven't seen him since I was last in Hong Kong over four years ago. Miss him so much! All China Glaze polishes this time! Left to right: China Glaze "I Herd That", "Adventure Red-y", "Velvet Bow", "Kalahari Kiss", "Exotic Encounters"
I started off with two coats of I Herd That as the base. Then I used a thin brush to paint the thick red lines with Adventure Red-y. 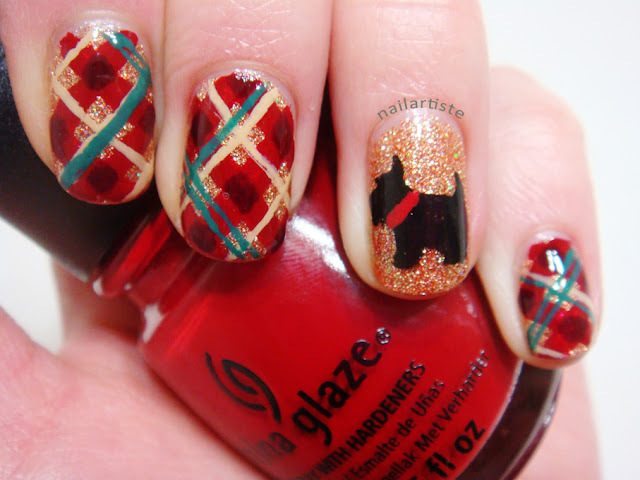 I painted little squares with Velvet Bow where the thick lines intersected. Then using a really thin striping brush, I painted in the thin lines with Kalahari Kiss first, and finally Exotic Encounters. Hope you guys enjoyed this post, and a big hello to all you new followers here! Super happy to have you, and thank you for reading! After my first try with striping tape, while I liked the look, I was pretty sure I didn't want to subject myself to that experience again any time soon. But somehow, here we are. Whitney at Dressed Up Nails has definitely been an inspiration. She's done fantastic things with striping tape! I began with two coats of China Glaze Prey Tell. It is the perfect, dark wine red shade that I've been craving. 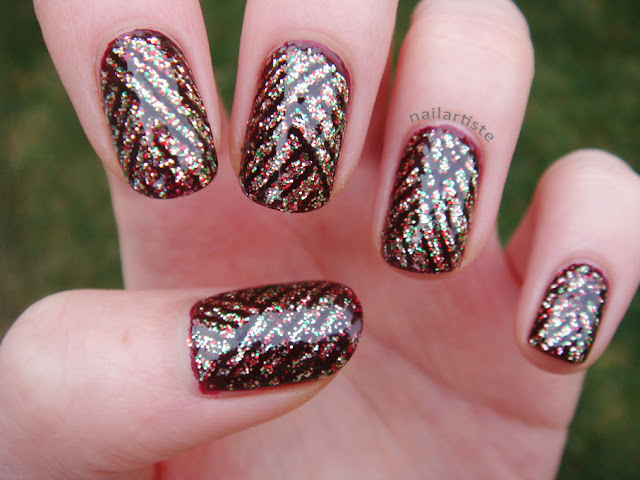 Then I laid down the tape, working one finger at a time, and painted a thick coat of China Glaze Twinkle Lights. 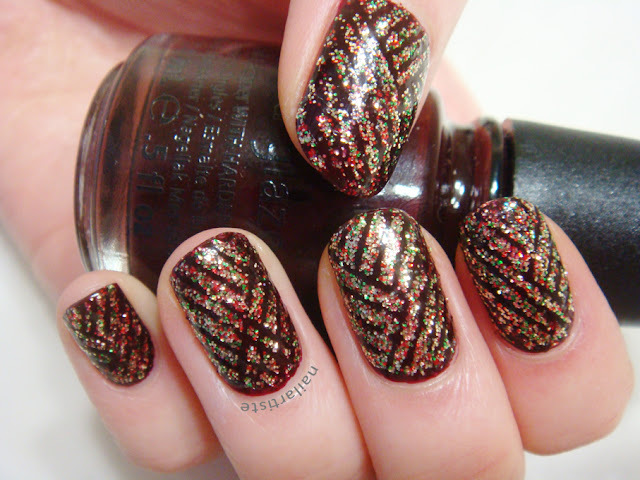 It's a beautiful holiday colour, with tiny gold, red, and green glitters. I did my ring finger first as an accent, then my thumb, then ok I'll do my index too so they're kind of alternating, then what the heck, I'll just do my whole hand. I was a bit more adept in laying down the tape this time, but there were a few curse words along the way, and moments of wanting to bite and gnash the tape off with my teeth. 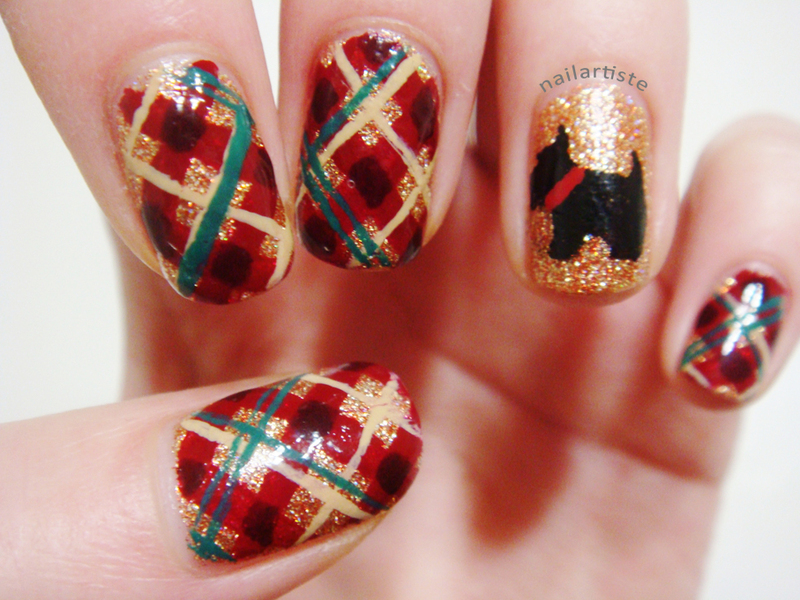 BUT I love the end result so much, I'm sure I'll do something like this again. For the sake of my sanity though, I'm going to get thicker striping tape. Reminder to my friends in Canada and the States to enter my holiday giveaway here! 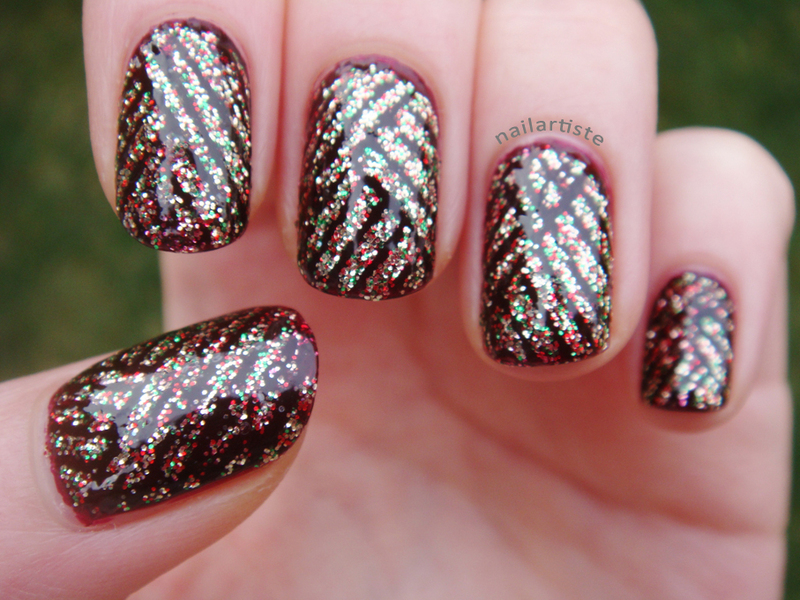 Today's post is a bit of a mixed bag with several mani's that I felt didn't need their own post, for whatever reason. But they're like my babies; I still love each one of them in their own way. First up is another Japanese inspired pattern. Kind of. I saw these fishies on the website of a Japanese restaurant, that counts, right? 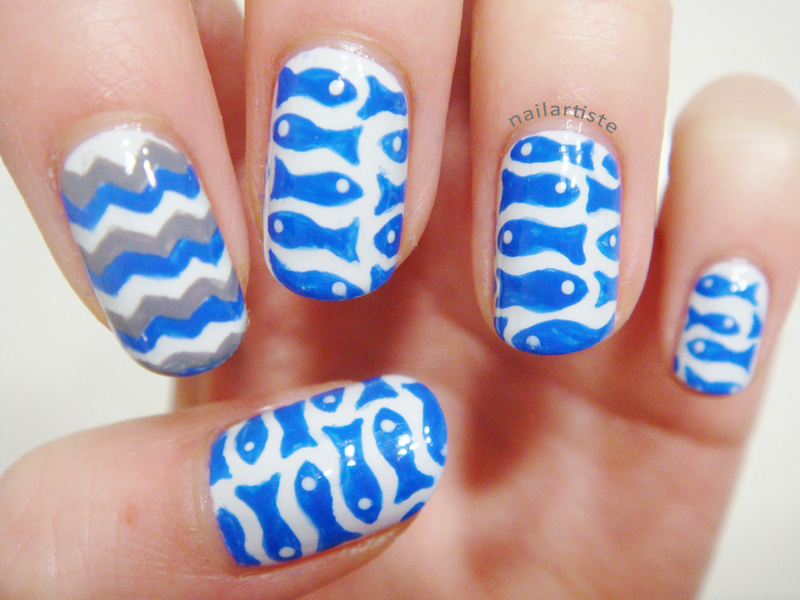 The thumb better represents how the pattern should look, as the fish are too lined up on my other fingers. 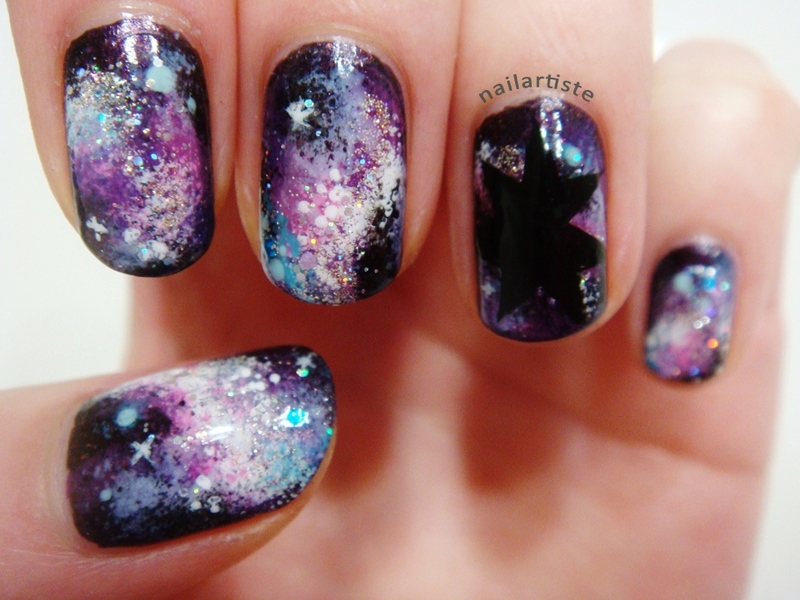 I think they would go well with my previous wave pattern mani. 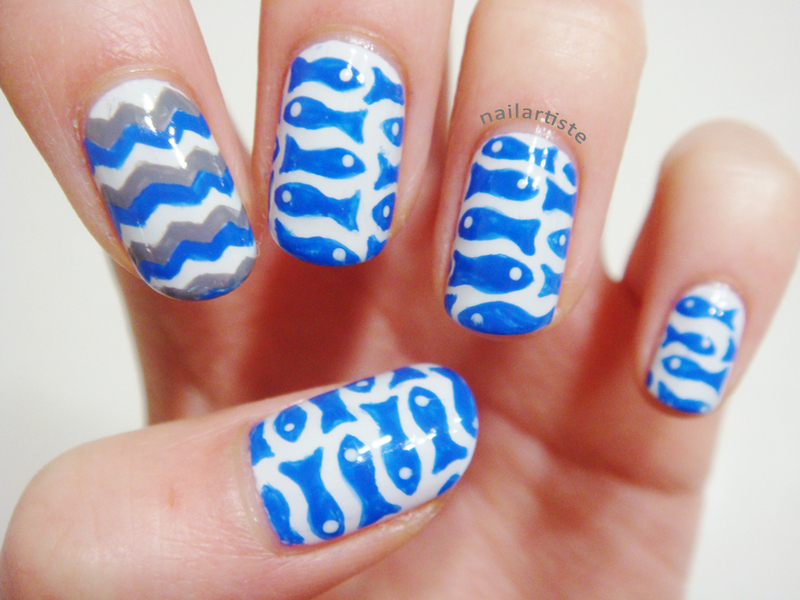 I even did an accent nail that's supposed to represent waves! I used OPI My Boyfriend Scales Walls (finally snagged it on clearance!) as the base, the blue is Nails Inc Baker Street, and the grey is American Apparel Factory Grey. Next up is a combination that looked super pretty in my head and it did look quite pretty in person, but it's a bit flat on camera, as you can't really see how pretty the glitter is. This is OPI My Very First Knockwurst as the base with Revlon Sparkling on top. 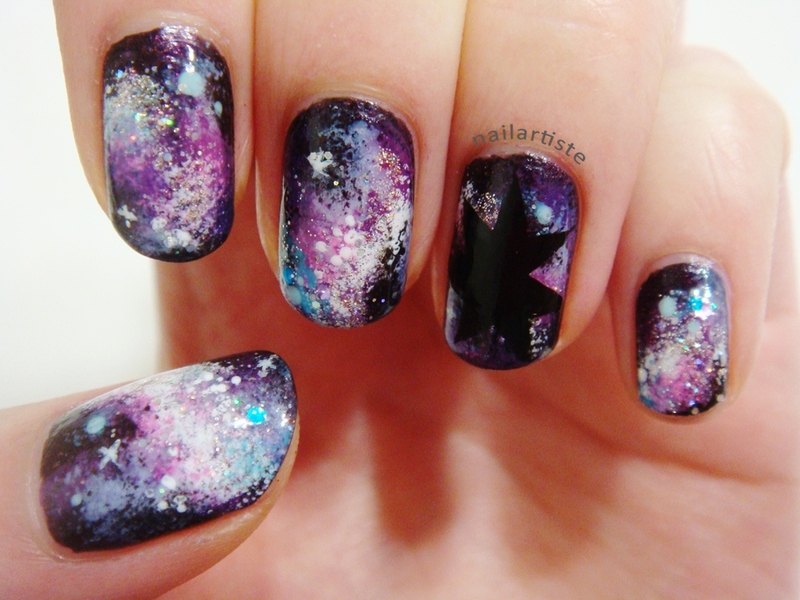 Last is another set of galaxy nails! These are very similar to my previous ones, except I reversed the colour scheme (purple and pinks as the main colour, blue and greens as accents), and used some different glitter. 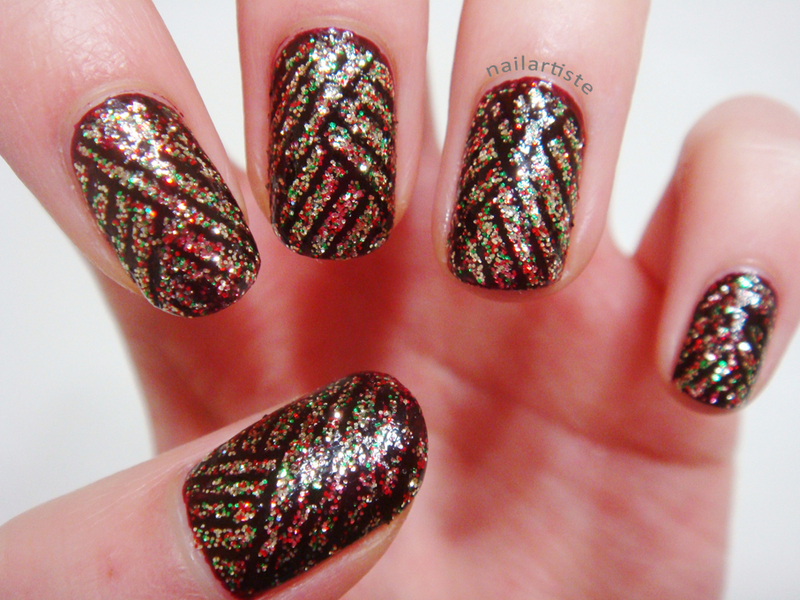 This time I used a black striper to paint my "big bang" and it worked out a lot better. I had fun compiling these different looks together! I'll probably do this more in the future. 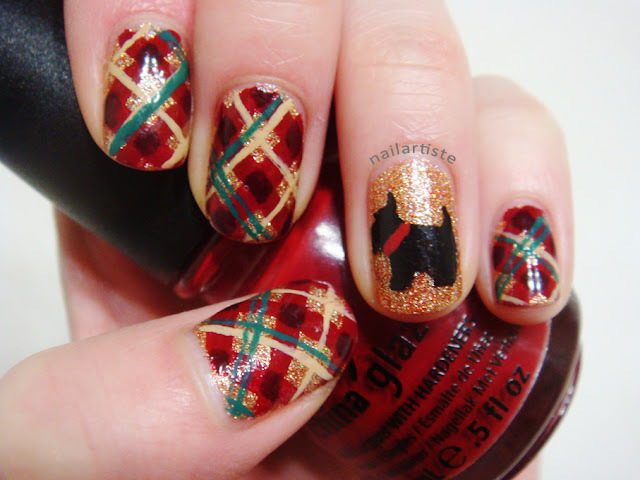 How did you like this mix of mani's? Don't forget to enter my holiday giveaway! A little something to celebrate reaching (now over) 100 subscribers, and to spread some holiday cheer! This Puttin' on the Glitz set includes three full-sized colours from China Glaze's Holiday Joy collection: With Love, Pizzazz, and Cranberry Splash. They're all really great holiday colours! This giveaway is open to Canada and the U.S., and ends on Dec. 31, 2012. 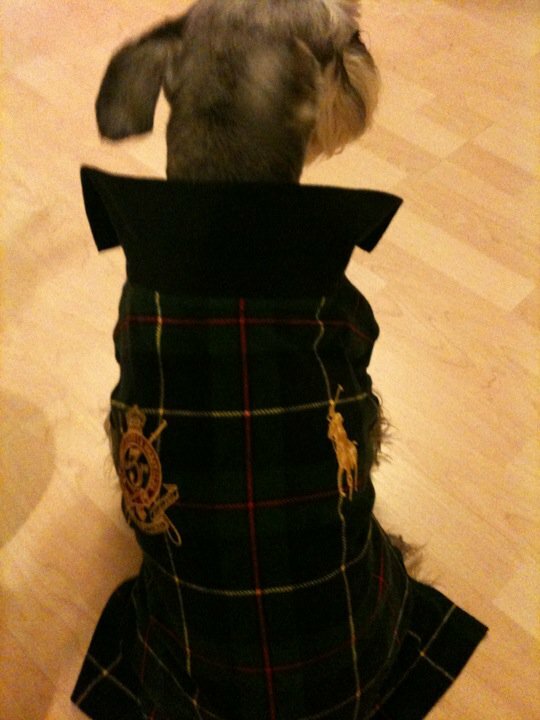 I will email the winner, who will have 48 hours to reply before another is picked. Thank you to all you wonderful readers so far! Starting this blog is definitely one of the best decisions I've ever made, because it lets me interact with this beautiful, talented nail polish community, and I am having an awesometastic time doing it. Love you all!